I'm sort of a loss for a cohesive topic today... I'm working a bunch of projects simultaneously, but nothing is "completed" yet. So I figured I'd post this icing recipe instead of saving it for Sunday. On Monday night, I baked up some Pillsbury Dark Chocolate cupcakes (because I'm a box mix kind of girl). However, I disregarding the package instructions of baking at 350degrees for 22min, and instead, heated the oven to 350, then when I placed the cupcakes in I turned the heat down to 325 and baked for 25 minutes. I saw this tip on pinterest (natch). I only got 17 cupcakes since I filled the cupcakes probably between 3/4 and 5/6 full, but I like a big cupcake. Anyway, to please the Husband and fulfill his two favorite food groups - chocolate and peanut butter - I made a peanut butter butter cream icing. I found two recipes, here and here, and kinda made my own in between. I love a good weekday treat! Happy Hump Day! I am with you lady, I like a big cupcake! Isn't Pinterest the best? I love that we can get all these cool ideas and organize them. Oh man, what a great tip! Deeeeelish! 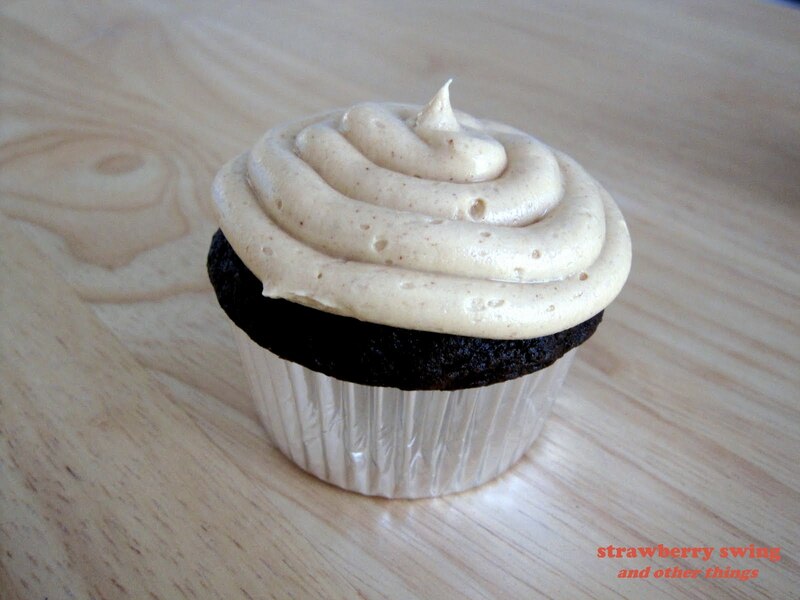 Love cupcakes, love peanut butter! Hahaha, your husband's two favorite food groups... I love it! And it sounds DELICIOUS. They aren't many left, they are soo good! Andi - pinterest is soooo addicting, but it's so much better than bookmarking websites and saving images to a folder... I love the organization, join! Conveniently for me, I had just volunteered to make cupcakes for my husband's family reunion this weekend. I just finished a batch of these with your icing recipe, and they are AMAZING! Thanks...I am sure they will be a big hit! These look SO SO good! Wow!